After reception the biomass is cleaned first and then crushed into particles of 2-4 mm. The biomass puree can temporarily be stored in a hygienisation tank where all substrate flows come together. The blended product remains here for a few hours, at a temperature of around 70°C. Insufficient moistured substrates must be allowed time for rehydration. If necessary, extra moisture should be added. Hereafter the puree is pumped to the Betaprocess for processing. In the Betaprocess all fibres, cell walls and cell membranes are ripped apart, so bacteria gain direct access to the sugars and other cell ingredients. 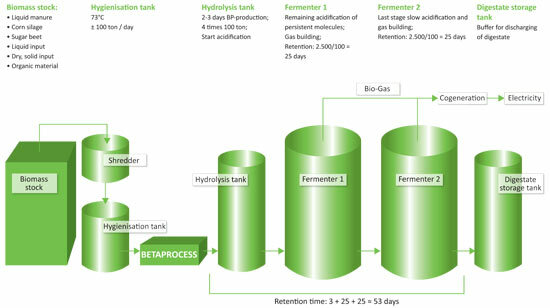 After Betaprocess processing, the substrate is pumped into a separate storage tank, which also functions as a hydrolysis tank. The puree stays here for another 2-4 days. In this tank the acidification phase starts, which is continued in the fermenter. Hereafter the fermentation process and re-fermentation take place. This takes approximately 25 days each tank. In these fermentation tanks methane-forming bacteria will transform the acids into bio-gas. The remaining digestate can be stored in a storage tank.